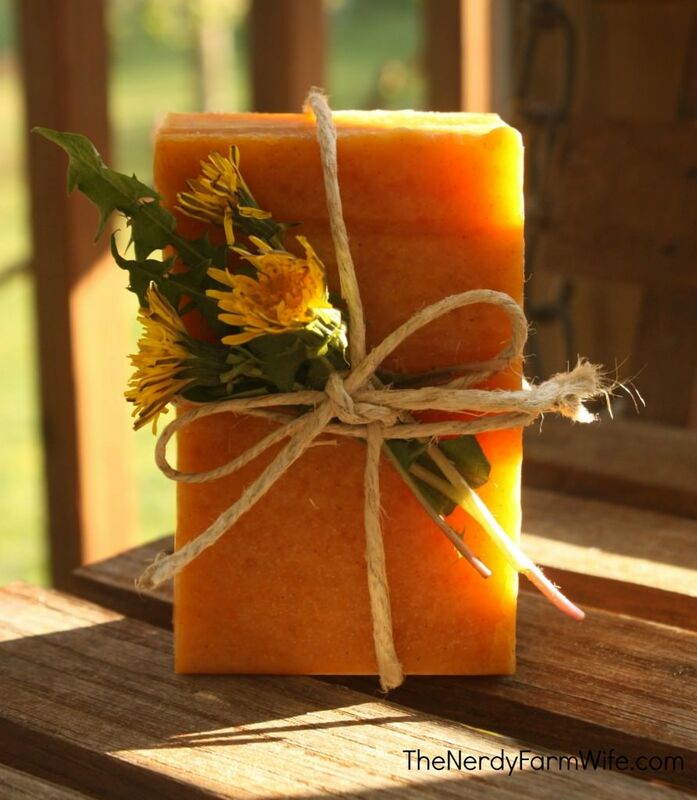 There is nothing more luxurious than handmade soap. It is so moisturizing and feels really amazing on the skin. Because you are in control of the ingredients, you can make it as natural as possible, no harsh chemicals. Honey has been used for centuries in skin care products. Ancient vessels recovered in Egypt showed they using honey for a variety of purposes, including skin care. 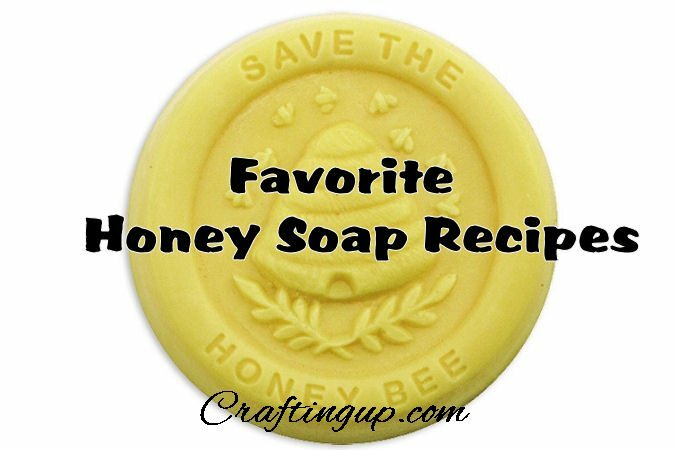 When used in soap, honey adds a wonderful richness that is excellent for dry skin. Our first two favorite honey recipes come from the same source – The Nerdy Farmwife – they both turned out amazingly well for us and the ingredients are unusual but fun. The first is her Honey and Dandelion Soap Recipe. The next recipe uses Carrots and honey. We were inundated with carrots in our garden last year. Since my husband won’t eat them, and I was pretty much carroted out, this recipe came in handy! I knew carrots were good for the eyes, but good for the skin too is an added bonus! Doesn’t it look amazing! There are two versions of this recipe and you can find them both here. The last recipe we chose because it is man-friendly. It seems most of the soaps out there cater to women. The men in our lives usually go along with using them, but mine will grumble if it is too “frilly” or “weird”. When I told him this recipe used beer, his ear’s perked up and he was a little more excited to try it. This recipe comes from OffBeat and Inspired and I have to say, this recipe is both. But it came out amazing and had a really cool scent. 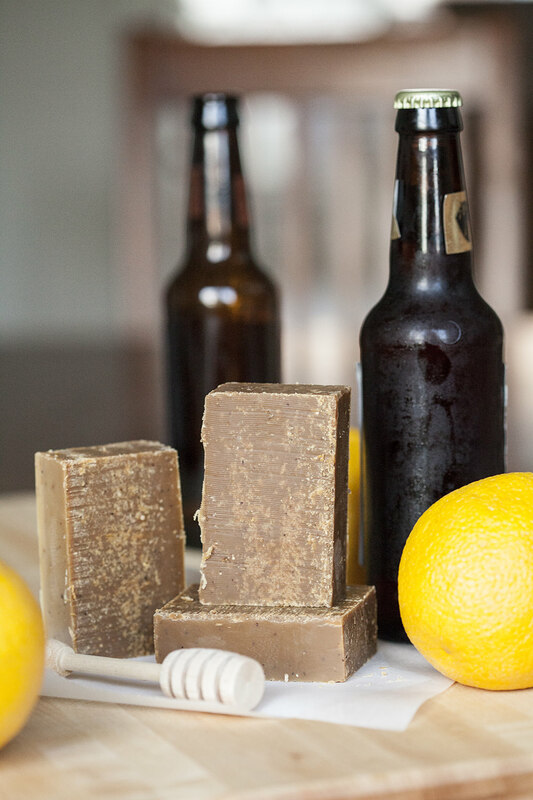 You can smell the citrus, but the smell of the stout does come through, making for a really nice soap. It also has a nice exfoliant of ground malted barley in it. Get this amazing recipe for Citrus Honey and Scotch Ale Stout here. Melting the soap: Cut 8 oz. of soap (½ of a 1 lb. block) into chunks, and place in a double boiler or microwave-safe container. Heat soap slowly until just melted. If using a microwave, heat for 15-20 seconds at a time. Soap melts at about 140°F and should not go over 160°F. If the soap gets too hot, it will smell bad and lose transparency and moisture. This is not what you want for your soap creation! Temperature control is one of the keys to making a good bar of soap. You can use a candle making or candy thermometer, but it’s not usually necessary if you heat the soap carefully. Stir very gently to avoid adding air bubbles to the melted soap. Adding color: Add your color, slowly drop wise. Remember to stir gently. For soft, pastel colors, start adding a very small amount of the colorant until it reaches the intensity you want. You can always add more, but you can’t take it out! Too much color in your soap can end up rubbing off on your skin, or leaving color rings in the sink or tub. A little color will go a long way. A few drops are generally all that are necessary. Adding scent: A little goes a long way! ½ oz. (1 tablespoon) of fragrance oil is the most you’ll need for one pound of soap…so for 8 oz., add 1 – 1½ teaspoons of scent, stirring gently. Be sure the fragrance you are using is soap-safe so it won’t irritate your skin. Also, keep in mind that the color of the fragrance oil will affect the final color of your soap. Vanilla based fragrances may also cause your soap to darken, or turn a grey to tan color. Use caution when choosing a fragrance. More is NOT better and can cause severe skin irritation, or burns. 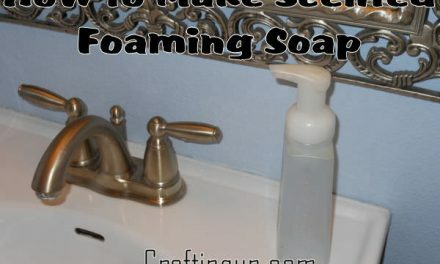 Pour into mold: Pour the melted soap into two 4 oz. soap mold cavities. Any air bubbles in the liquid soap will rise to the top. To remove the bubbles, you can lightly spray with rubbing alcohol right after pouring, or smooth them off after the soap is finished. Let the soap completely harden before removing it from the mold. 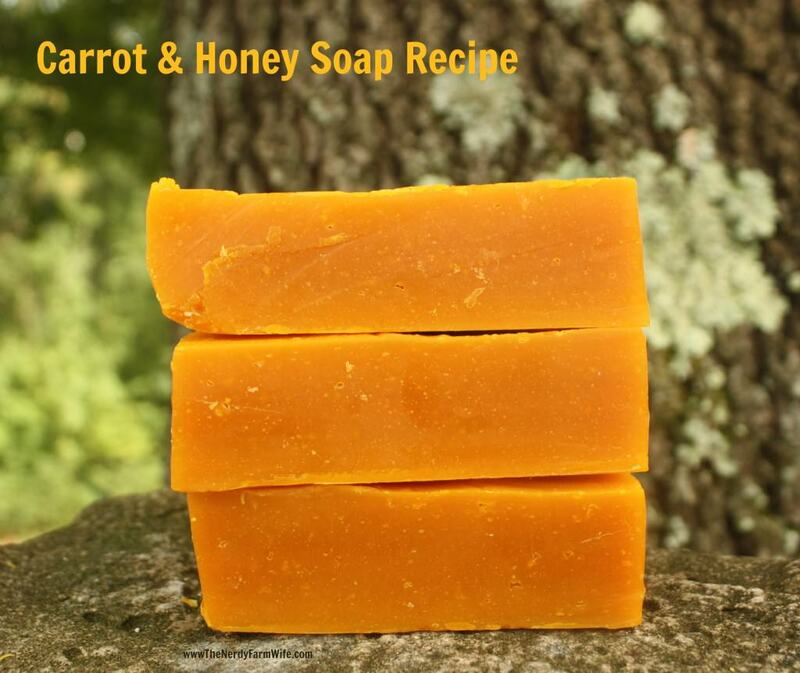 Unlike making soap from scratch, you do not have to wait for melt and pour soap to “cure”. Your soap is ready to use as soon as it hardens. If you won’t be using it right away, wrap the bar(s) in plastic wrap. Your soap is high in glycerine content which softens the skin. It also attracts moisture, especially in humid climates. If left out in the air, it will form beads of moisture on it, and will become unattractive and messy. You can prevent this by wrapping your soap in airtight plastic wrap. Let us know if you try any of the recipes and what you think, in the comments!